By buying this product you can collect up to 25 Reward Points. Your cart will total 25 points that can be converted into e-voucher of RM0.25. - Helps improve mood and reduce emotional eating. 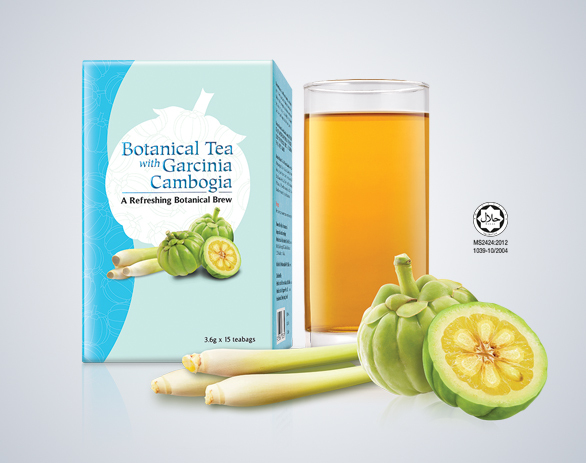 Beauxlim Botanical Tea with Garcinia Cambogia is a refreshing botanical tea blend for your daily enjoyment. Every sip provides the goodness of green tea, lemongrass, Garcinia Cambogia and other botanicals that complement good health. High in antioxidants for various health benefits. Helps boost fat burning and metabolic rate. Helps improve mood and calm. Helps improve mood and reduce emotional eating. Garcinia Cambogia is a small, pumpkin-shaped citrus fruit that grows in Southeast Asia. It is a fairly common ingredient used in making curries. Recent research has shown that it may help in weight loss when combined with a healthy diet and a regular exercise regimen. Zenoctil fat burner helps lose weight and maintain a healthy weight in three ways. – fat cells destruction and fat tissue decrease. – prevention of new fat cells formation and depositing. – reducing of fat absorption in the digestive tract. Total Image Xlim Tummy traditionally used to improve bowel movement, relieve constipation and helps to reduce body weight. Take Total Image Xlim Tummy and get back your confidence with a flatter stomach. This product is an absolute "must have" for those who wish to reduce their tummy. Ideal for both men and women. Natural Clenx Tea is a high quality detox slimming tea made from 100% natural organic green tea and herbs, with no laxatives, no added sugar and no side effects. This traditional herbal formula is used to stimulate peristaltic movement of intestines. Orang Kampung Teh Herba + Halia dirumuskan khas daripada daun teh Senna Maki (Cassia Angustifolia) dan campuran herba-herba tradisional. Digunakan secara traditional untuk mengurangkan berat badan and membuang angin dalam badan. Traditionally used to reduce weight and expell body wind. The Benefits of Dr. Fit Vege High Fiber: - Improve complexion & reduce weight; - Slim down the body; - Enhance bodily functions; - Maintain a healthy intestinal tract; - Get rid of bowel waste; - Increase probiotic bacteria in the intestines. timo® Super Fiber is a scientific formulation containing different types of plant fibers, prebiotics and alkaline food that work together to bring powerful detoxification effects as well as to support optimal colon health. Fiber King for proper management of colon and supply of pyhto-nutrients.